Within the earth’s magnetosphere — the electrical shield which functions as a smaller planetary dynamo equivalent to the sun’s huge electromagnetic field — there is a spinning scalar vortex running through the earth which is apparently kept in place by the moon’s position and rotation around the earth. We always see only the single face of the moon, in all her phases, inclined towards Earth in permanent gaze — a geomagnetic/lunar arrangement which is scientifically impossible according to simple gravitational theory — only one of the moon’s many anomalies which few except plasma scientists will touch. However, the moon seems to perpetuate this axial configuration on a scalar electromagnetic level, pulling earth’s tides and in turn being pulled closer and repelled by earth herself. These motions are embedded within the ancient characteristics of astrology, surrounding the Moon’s North and South Nodes, imaginary locations which have been known from time immemorial as the Dragon’s head and Dragon’s tail. Both legend and astrology connect the Nodes with the ascendant, a point representing the rose-colored glasses we constantly look through (both directions) as we occupy an avatar, in this plane on the surface of the globe. The serpent, ‘Lucifer’, ‘angel-of-the-dawn’, the light-bearer all signal the astrological ‘ascendant’, calculated as the point where the light of dawn shines on that part of the world when the subject of the astro-chart is born. It gives the chart its orientation and reveals the functional level where unseen forces manipulate development and motion or flow of life within the incarnate who inhabits the avatar. In Hinduism, an avatar, Hindi: [ˈəvət̪ɑːr], English: /ˈæv.ə.tɑːr/, (avatāra: Devanagari अवतार, Sanskrit for “descent” [viz., from Heaven to Earth]) is a deliberate descent of a deity from heaven to earth, or a descent of the Supreme Being (i.e., Vishnu for Vaishnavites) and is mostly translated into English as “incarnation”, but more accurately as “appearance” or “manifestation”. From this constant flow and vibration, electromagnetic resonance of the earth can be calculated. That results in a shape (wave, graph, grid) for the resonance, which allowed Berthe Hagens and Bill Becker to devise the Becker-Hagens vortex grid. This earth grid is based on known energy focal points (Wiltshire-speak’s ley lines) with its nodes spaced in configurations exactly matching the Platonic solids: the cube, tetrahedron, octahedron, dodecahedron,and icosahedron. The 5 Platonic solids (Tetrahedron, Cube or Hexahedron-6, Octahedron-8, Dodecahedron-12 and Icosahedron-20) are ideal, primal models of crystal patterns which occur throughout the world of minerals in countless variation. Because of their intrinsic use by Mother Nature, they are known as forms of Sacred Geometry. The earth’s own neutral center is a dimensional window that vibrates at frequencies resonant with the earth’s own spherical harmonics. I’m not certain whether these spherical harmonics correlate to mechanical, electromagnetic, or gravitational vibrations. Whatever the case, standing waves are set up that create equally-spaced node and antinodal points on earth’s surface. The Becker-Hagens Grid incorporates the Platonic solids and the 20-sided icosahedron to create a grid of 62 points. It is worth reading their work, as they delve deeply into the historical background for such an earth grid. 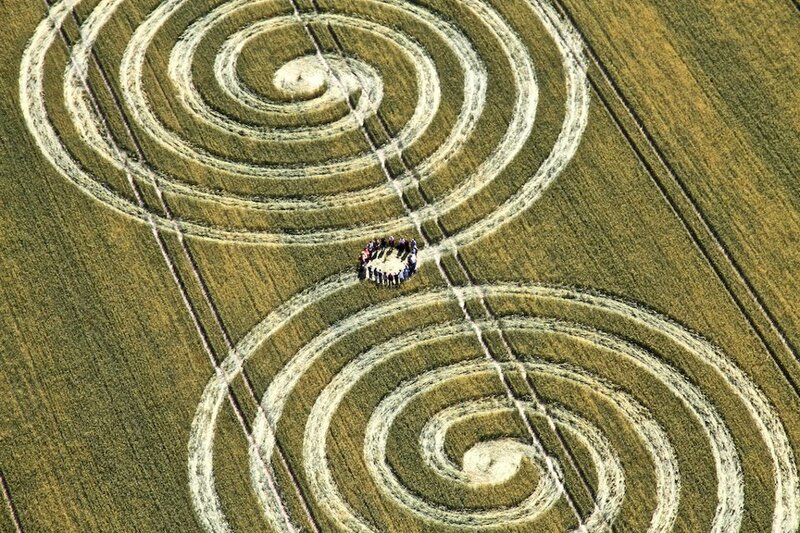 This dual vortex (in opposing directions) has a continuous flow that rings the earth like a large horn or bell. Their research seems to indicate that the moon exerts influence via interference with the earth’s original energies. Interestingly, the same grid was well-known to the ancients who built megalithic structures at nodal points on land and knew to navigate around such energy vortices (as Great Abaco-Bermuda Triangle, Corryvreckan and the Maelstrøm) in the oceans. The Dragon Project of Dr G.V. (Don) Robins was one of the first to document measureable energy fluxes at such Neolithic sites as Rollright Stones in the 1980s. The eponymous Dragon was that magical energy stored in the ground which ancient myth likened to a sleeping dragon: the same beast which early Christian saints — Michael and George — slew in their efforts to wean country people (pagans, fr. Latin, paganus, country person) away from such ‘nonsensical’ belief in earth magick and superstition in an earth energy rivaling God. Robins’s Geiger counter and ultrasound readings were anomalously absent inside the stone circle precinct at Rollright, Oxfordshire, compared with background radiation outside the stone periphery. He measured the nearby King Stone, a huge outlier, over a period of five years, finding that it pulsed regularly each day at 30 minutes and 10 minutes before dawn, with pulsations strongest at the equinoxes and less marked at the solstices. Don Robins, “The Dragon Project and the Talking Stones,” New Scientist, 96: 166, 1982. Guy Underwood, author of Patterns of the Past, and Tom Graves Needles of Stone recorded anomalies at Arbor Low in Derbyshire and Long Meg, Cumbria. Locally, it was common knowledge that larks and swallows seemed drawn to the ultrasound emanating at both stone circles. Gerald Hawkins’ team found high-energy readings emitted from a cupmarked circle stone at Temple Wood, Kilmartin, Argyll in 1973. 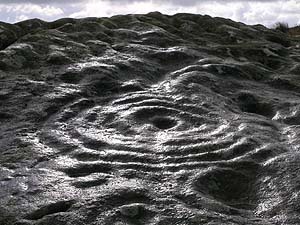 Neolithic stone circles in Aberdeenshire have documented high-energy, thought to be ‘stored’ in the quartz inclusions present in many granite ‘recumbent’ stones chosen specifically for placement in the southwest of the circle to ‘capture’ the dying sun in midwinter, major standstill moonset and the setting sun in the north at summer solstice. As with stone circles in Northern England and Wiltshire, most are placed over underground aquifers where it is thought the stones acted as ‘radio masts’ to collect the subterranean energy and transmit it above ground along the planetary grid. Aberdeenshire also has its ‘ringing’ stones which sounded like a bell when dawn sunlight hit. A similar phenomenon was recorded by Strabo at Thebes when the northern quartz Colossus of Memnon sang at dawn. 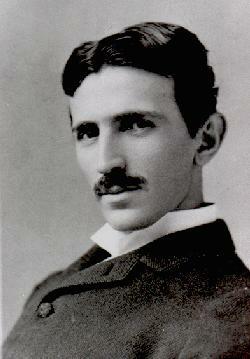 Nikola Tesla discovered in 1901 that when a metal was illuminated by high-frequency light (e.g. ultraviolet light), electrons were ejected from the metal at high energy. This work was based on the previous knowledge that light acting on metals produces a current, but Tesla was the first to describe it as a particle phenomenon. Further, it was discovered within the year that energy emitted by these ejecting electrons did not depend on its intensity but its frequency (wave-form): in order to produce high energy electrons, one must illuminate the metal with high-frequency light. The more light there is, the more electrons are ejected, but intensity depended on frequency alone. This very interesting discovery was intrinsic in the Manhattan Project‘s production of the first ‘atom’ bomb. However, more recent — and ongoing — research into e.g. CERN’s Higgs-Boson particle and OPERA at the Large Hadron Collider (LHC), has much wider (and potentially more hazardous) implications for mankind, should present work on electromagnetic scalar wave technology be controlled and used for destructive, rather than constructive purposes, in leading humanity through its present crisis. When Einstein received his Nobel Prize in 1921, it was not for his more difficult and mathematically-laborious special and general relativity, but for the simple, yet totally revolutionary, suggestion of quantized light. Einstein’s “light quanta” are what we now call photons. They are a quintessential example of light’s wave–particle duality. Electromagnetic radiation propagates following linear wave equations, but can only be emitted or absorbed as discrete elements — thus acting simultaneously as both a particle and a wave. Despite ongoing demands on world nations’ already overstretched budgets for potentially-hazardous nuclear power and coal-generation plants, little focus falls on the fact that during the 1930s, the US Navy, Stanford University and General Electric exploited Tesla’s free energy system. While some of the patented equipment they used is too complex for the lay person to understand, Bill Morgan simplifies in his ‘beginner’s guide’ what he calls the ‘Scalar Wars’ of the free-energy movement begun by Tom Bearden. The layman will need to understand that there is a new kind of energy that is altogether different from what he knows, e.g. radio, TV, cell phones, etc. This is electromagnetic energy. Ordinary EM waves that we have known about are called transverse EM waves, to distinguish them from the new longitudinal EM waves. These scalar waves do not actually exist in our ‘material’ world, but exist only in the space dimension, or the time domain. And we must keep in mind that this space exists all through everything. Our bodies are mostly empty space between atoms and molecules. So the gateway to this ocean of energy can be there at every point in the universe. This seething ocean of energy is all around us and all through us. Needless to say, Bearden stresses the destructive potential of military and power-driven use of such technology. It is important to remember that (in astrophysics and hydrodynamics) scalar wave fields exist in a fifth-dimensional, non-linear, context. Third-dimensional laws of nature do not operate here. Scalar wave fields exist out of our relative time (4th) and space (3rd) dimensions and as such, do not decay over time or distance. As we explore higher dimensions, we begin to encounter new parameters, new ways of thinking. There is another, benevolent, aspect to what Einstein called zero-point energy — Tesla’s ‘radiant energy’ — which few may have read about. Bill Morgan simplifies Bearden, describing Longitudinal EM energy which fills the ‘vacuum’ of space, the time domain of spacetime, and expresses time as compressed energy, with the equation E = Δtc2, above, as waves of time, or Energy equals (delta=change) in Time accelerated to the speed of light, squared. We can travel to the distant stars. And now the wormhole of time — compressed energy — is opening up before our eyes. What synchronicity. Just when we had all mastered Einstein’s other equation: E = MC2. In typical positive style, Morgan suggests solutions to the energy crisis and the “oil problem” are in hand. That oil wars are unnecessary because there is endless energy freely available from the domain of time. Also that future cure of all disease is within our grasp. This ability was also suggested by Jesse Stewart’s time travel group, who used the mechanism of returning to NOW from the past as a means towards youthening and restoring health. They called it Regenesis. Unbelievably powerful weapons are not only possible, but are already operating in several nations. The many powers of these weapons are unprecedented and mind-boggling. Mind control on a mass scale (via electromagnetic tweaking of our human circuitry) has now become possible, and machines to do it are already in place in certain nations. It has become possible mentally to enslave whole populations with the twist of a few dials. With these warnings, there is much work ahead for us, the human family, to accomplish; with only a window of opportunity of a couple of years. Jesse Stewart’s travelers also gave an account of a crisis facing Humanity in the 2013-2015 time window: that other dimensional civilizations share consciousness that helps them rely on a centralized benevolent Intelligence which guides actions and words, subdues conflict and spreads a loving and compassionate feeling within all interaction. He suggests Humanity is learning how to think as Group Consciousness, but that we shall have to speed up our ability to use this intuitive capacity — this inner loving guidance system — very rapidly, if we are to weather the storm and defuse the threat posed by such massive weaponry as some less-disciplined nations possess. They see this as our current dilemma: the human crisis. None of the future scenarios envisaged by either time-frame dimension is able to penetrate the 2013-2015 window: the glass is dark. Our Human future is in our hands. We must write that chapter ourselves. Now that we can travel to the stars, it’s time to take care of business at home. And it is crucial that we take our own collective consciousness concept seriously. We are creators. More than ever before, our future depends on us. This entry was posted on September 22, 2011 at 3:23 am and is filed under Ascension, astrology, astronomy, calendar, crop circles, Evolution of Consciousness, legends, mythology, quantum physics, sacred geometry. You can subscribe via RSS 2.0 feed to this post's comments. Another brilliant post, Good Sister. Seems we’re rapidly entering the rough patch of the cycle, the bit where Humans that Love and Care must confront those who promote hate and strife. Mankind’s puberty, leaving the childish tantrums of me/my and transitioning into the realm of Our/Us. I can see it everywhere now, it’s become constant. With a few choice words I can usually work out where people stand. Seems our race polarized very early in history, which is less past and more present, every moment folding back into itself. Time hits the zero point, we are in a perpetual now, its merely social conditioning to see ourselves as linear projections from start to stop. And here is where I find those around me, lodged in the amber of ‘perceived’ time. Because of that, the desperation of material want superimposes its anguish over the ever-present moment, as if the material finite were real and the infinite etheric were mere fancy. I see some around me endorse war in the middle east, while missing the point that what’s done there is done to all of us. A simple shift of perception and it’s them dying in a dusty street. It’s Me and You starving in Africa, it’s US desperate for relief in the hospital waiting rooms world wide. It’s US bombing Kids from a Drone strike in Pakistan, and its US being bombed. The useful cell wall of EGO – of itself not a bad thing – has been turned against Humanity, to make us IN-DIVIDE-YOU-ALLs/individuals. Divided within and divided without, many are missing the offramp to the transition point. I can’t help but see that as deliberate interference. That we can maintain a coherent sense of unique self, yet still merge harmoniously with others to become a composite of selves, barely registers with those I talk to. It seems too much like fiction; I’m not talking of the communist ‘DEATH’ which is Kollectivism, but that rarer state long-sought and long-absent in this world. Ah Tesla, what a mind. I think he probably nailed our energy issues back around the turn of the 19th to 20th century. Thanks for the link, but I’m standing on a ladder, balanced on a cherry picker teetering on the shoulders of giants. That, and I’m still getting this blogging thingy sorted. Who knew digital layout was so tricky, plus YOU set a high standard in content, editorial structure and plain old English. I’ve yet to tick all the boxes on each of those, damn public education, down here public = government funded. It’s a wonder I can spell at all. May the Northern winter be mild and brief for you, and may the English spring arrive on swift wings. Truly impressive piece of writing Marian. There are so many things you mention I just wish I knew more about, or had time and resources to learn. Being involved with electronic engineering, Tesla has always been, for me, the most underrated pioneer of science. I would love to have met him. As a ‘by-the-way’ point have you heard the reports from CERN that a particle (the neutrino) has been measured at traveling in excess of the speed of light? I believe they are still checking for any errors in measurements, but are confident enough to release such information and have now asked Fermilab to try and repeat there work. You are too kind, Rob. Your own prowess is masterful. I might have known you were schooled in electronics! I am merely a dilettante. This one took me hours and hours and hours of head-twisting. And when I read about the neutrino, I almost added it as a postscriptum, but thought that would be too much, particularly as I *believe* the neutrino pipping the post is probably a *dimensional* aberration — and that deserves a whole ‘nother blog — as they say across the pond… Thank you for your visit. I hope your comp.probs get solved quickly. As a wiz, you deserve better! I have heard there is a govt. project involving Telsa’s work ongoing in Oklahoma right now. Thank you for this reference, Tom. The BIGGG Tesla Coil (OKLA) seems to have taken off — it’s only 113 years since Tesla made his breakthrough in *1899* at Colorado Springs by transmitting 100 million volts of high-frequency electric power wirelessly over a distance of 26 miles to light up a bank of 200 electric bulbs and run one electric motor! What a role model.